Singer Linda Ronstadt not only got booed, she got the boot after lauding filmmaker Michael Moore and his new movie, Fahrenheit 9/11 during a performance at the Aladdin hotel-casino. Before singing "Desperado" for an encore Saturday night, the 58-year-old rocker called Moore a "great American patriot" and "someone who is spreading the truth." She also encouraged everybody to see the documentary about President Bush. Ronstadt's comments drew loud boos and some of the 4,500 people in attendance stormed out of the theater. People also tore down concert posters and tossed cocktails into the air. "It was a very ugly scene," Aladdin President Bill Timmins told The Associated Press. "She praised him and all of a sudden all bedlam broke loose." Timmins, who is British and was watching the show, decided Ronstadt had to go — for good. Timmins said he didn't allow Ronstadt back in her luxury suite and she was escorted off the property. Ronstadt's antics "spoiled a wonderful evening for our guests and we had to do something about it," Timmins said. Timmins said it was the first time he sent a performer packing. "As long as I'm here, she's not going to play," Timmins said. 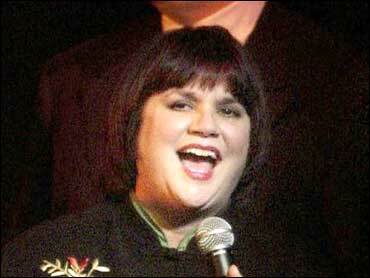 Ronstadt had been booked to play the Aladdin for only one show. Calls to Ronstadt's manager were not immediately returned. In an interview with the Las Vegas Review-Journal before the show, Ronstadt said "I keep hoping that if I'm annoying enough to them, they won't hire me back."